Think about it. How many times have we come across “rosy, apple cheeks” in seemingly staid Victorian literature with simmering undertones? Or “a honeyed tongue, dripping with sweetness”? And all our hearts have no doubt beat just that little bit faster as we read about kissing “those sensuous lips, like ripe strawberries”. Using the attributes of food to describe the physicality of a person, and sometimes even their character, has been an exercise in similes that most of us seem to have adopted effortlessly from the written word. In the world of visual art however, it fell upon an Italian painter to bring to life this personification on the canvas. 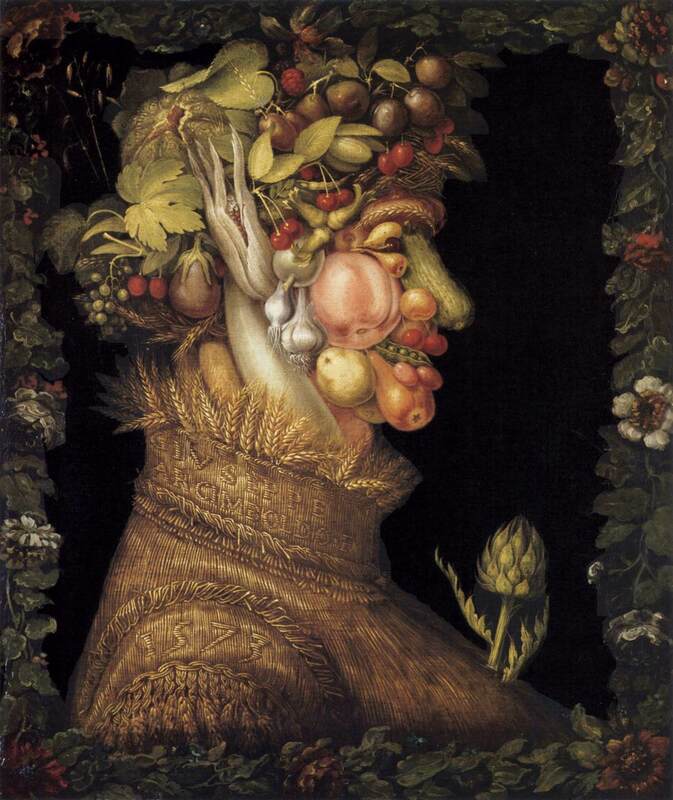 I confess I had never heard of Giuseppe Arcimboldo. That was before I came across his work in person. In the unique little ironies that only travel can bring about, my first encounter with this Italian Renaissance artist was in Vienna. On a bright, early autumn morning at the Kunsthistoriches Museum in Vienna, after several hours of serious consideration of several Flemish masterpieces, and German portraiture, I came across what I can only describe as a work so different and whimsical, that it drove away the slowly descending ennui that creeps up on you after a prolonged dunk into the bucket of culture and art. The painting, titled “Summer”, is one of a 4 part series on the Four Seasons. Two of them are at the Kunsthistoriches Museum, while the other two are at The Louvre in Paris. What immediately strikes you upon looking at the work is the way the artist has used fruits and vegetables that are prevalent at summertime, to compose the singular feature of the work – a human head in profile. It is not clear immediately if the subject is male or female. It’s the kind of painting, that, after that first burst of laughter at its whimsy, invites you to look closer, to spot all the clever details. And there are many. Once you grasp the singular concept, it is an easy temptation to look closely and try and find all the different food allegories that have been used. Look closely at the cheek area and you will find a peach, garlic, white pearl onions, yellow beets and white eggplant. The lips are not strawberries, but the more seasonally apt cherries, and a split open pea pod with little green peas provides the grimacing smile. The nose is unmistakable as a cucumber or a courgette, while the chin is a pear. The eyes are composed of a gleaming cherry between two small pears, with the eyebrows fashioned out of curved ears of grain. 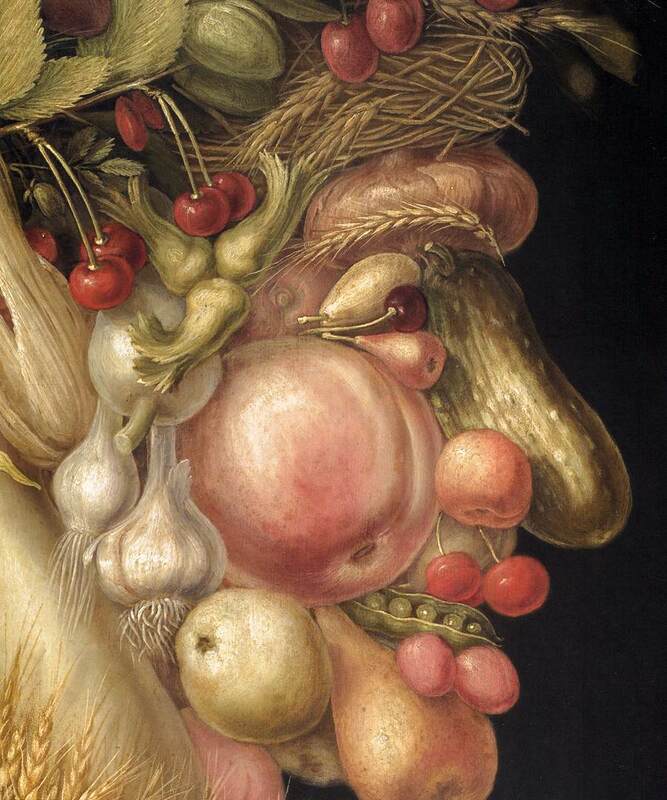 Speaking of ears, in a detail that made me laugh out loud, Arcimboldo has literally chosen an ear, of corn. The forehead is mottled with crinkly brown onions with hazelnuts embedded in the temples. The head is crowned with a melange of summer fruits and vegetables growing in abandon, from which horns of oat emerge as feathers. Below the neck, the clothing made of woven straw encircles the nape like finely wrought jewellery, and an artichoke provides the stunning final visual pun. A more ringing endorsement of “eat your fruits and vegetables” would be hard to find. 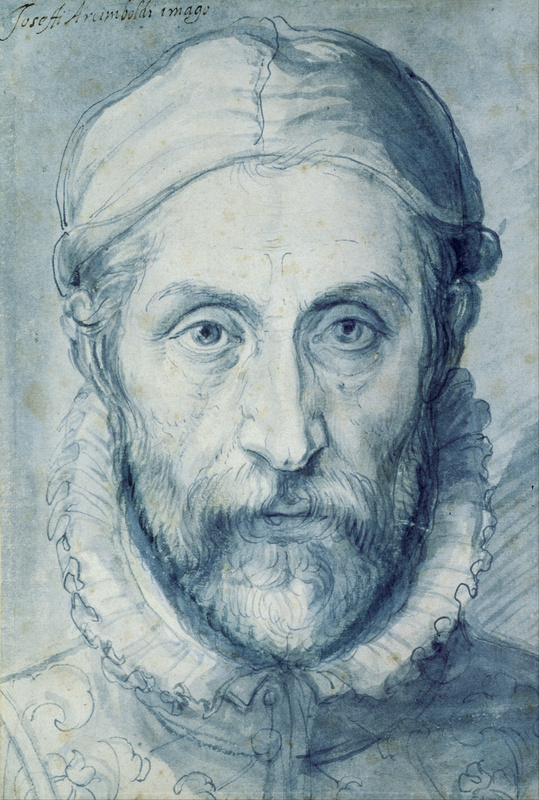 Arcimboldo may not have been the first to employ this concept and technique, but he certainly seems to have been the most proficient at it. He was Milanese and worked on frescoes in his home town, and was also involved in designs for the stain glass at Milan cathedral, before coming to Vienna in 1562 and becoming a court artist at the Hapsburg court. These unique blends of portraiture and still life were enjoyed as follies and humorous caprices in court. I must confess to a sense of a strange discomfort after perusing the work for a while. After the initial mirth at the slapstick nature of the piece, the face, with its vacant stare, in the midst of all the summer bounty, begins to feel creepy, even grotesque. This indeed is the reaction that this style of this late Renaissance period, now termed as Mannerist, wanted to evoke. The fact that a noble countenance could be so mocked was the point. There is nothing special about the technique, it is the allegory that supersedes everything. So the next time you find yourself describing someone’s pomegranate cheeks, or gazing into eyes like dark mulled wine, spare a thought for this talented artist, who brought humour and whimsy through his unique abstractions to the Hapsburg court.